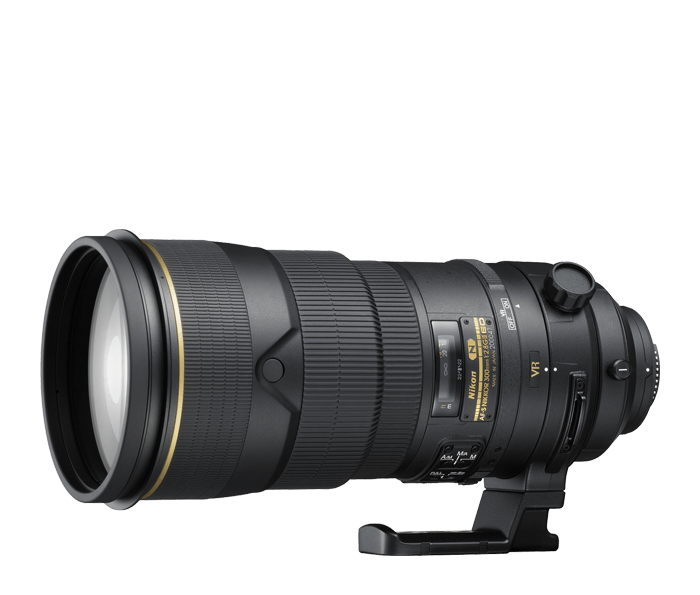 Enhanced legendary f/2.8 300mm super-telephoto prime lens. Nikon’s renowned 300mm f/2.8 professional super-telephoto lens is now reborn with second-generation Vibration Reduction (VR II) image stabilization and Nikon’s latest lens technologies for even greater performance. The AF-S NIKKOR 300mm f/2.8G ED VR II delivers exceptional professional results for sports photography, live performance shooting, wildlife and much more. If greater reach is needed, the AF-S NIKKOR 300mm f/2.8G is fully compatible with all Nikon teleconverters. The AF-S NIKKOR 300mm f/2.8G ED VR II combines an ultra-fast f/2.8 maximum aperture, Vibration Reduction (VR II) image stabilization and professional telephoto performance optimized for edge-to-edge sharpness on both Nikon FX- and DX-format DSLRs. If action and sports photojournalism, live performance shooting or wildlife photography is your calling, no lens outperforms the AF-S NIKKOR 300mm f/2.8G ED VR II. And if greater reach is needed, the AF-S NIKKOR 300mm f/2.8G ED VR II is fully compatible with all Nikon teleconverters. Boasting renowned NIKKOR optics, the AF-S NIKKOR 300mm f/2.8G ED VR II also employs the latest Nikon technologies to help produce razor sharp images in challenging situations. Nikon VR (Vibration Reduction) image stabilization provides 3.0 stops* of blur free handheld shooting, assuring dramatically sharper still images and HD video capture. Silent Wave Motor (SWM) enables ultra-fast, ultra-quiet autofocusing with seamless manual override. Nano Crystal Coat (N) and Extra-low Dispersion (ED) glass virtually eliminate ghosting and lens flare and produce superior sharpness, contrast and color. Enhanced dust and moisture-resistance, magnesium die-cast barrel construction and a protective meniscus front lens deliver the durability working photographers demand. A Nikon in-lens technology that improves image stability by automatically compensating for camera shake. Lenses that offer VR will feature the abbreviation VR on the lens barrel. AF-S NIKKOR lenses feature Nikon’s Silent Wave Motor (SWM). This technology converts “traveling waves” into rotational energy to focus the optics. This enables high-speed autofocusing that's extremely accurate and super quiet. An anti-reflective coating developed by Nikon that virtually eliminates internal lens element reflections across a wide range of wavelengths. Nano Crystal Coat solves ghost effects caused by red light and effectively reduces ghost and flare caused by light entering the lens diagonally. An optical glass developed by Nikon that is used with normal optical glass in telephoto lenses to obtain optimum correction of chromatic aberrations. Select NIKKOR lenses have a focusing mode which allows switching from automatic to manual focusing with virtually no lag time by simply turning the focusing ring on the lens. This makes it possible to seamlessly switch to fine manual focusing while looking through the viewfinder. A/M stands for Auto-Priority Manual Mode. This mode also enables an easy transition from autofocus to manual during AF operation. However, mode switch sensitivity has been altered to reduce the possibility of sudden unintentional switching to manual focus while shooting. A NIKKOR lens in which only the internal lens group shifts during focusing. Thus, IF NIKKORS do not change in size during AF operation, allowing for compact, lightweight lenses capable of closer focusing distances. These lenses will be designated with the abbreviation IF on the lens barrel. *Based on CIPA Standard. This value is achieved when: FX-format compatible lenses are attached to an FX-format digital SLR camera.